Bear lays with human, not bear. Or so the old bear law has always said. It was beaten into Declan and his brother bear, Ryder’s heads since they were small, just like every other cub in school. 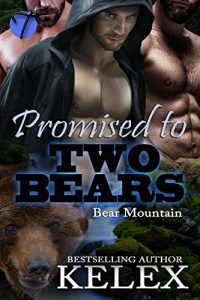 Yet when they find their mate, an omega, sneaking a dip in the mountain’s spring, Declan can’t ignore the need he feels, bear or not. Ryder feels the same lusts, but he’s much more concerned about an omega being their mate. He knows claiming another bear could get them exiled. He stops Declan before things go too far, but even that isn’t enough to stop them from being sent off bear lands. Gage knows his mates when he sees them, but also knows they can never be together. As an omega, he’s the lowest chaste in the bear world, an invisible slave to those above him. The fantasy is too scary to imagine, no matter how much his body yearns to be claimed by the two handsome males. It’ll take the bear world to be flipped upside down for the three of them to find a way to be together.